The Lorient Inter-Celtic Festival has long been crowned the undisputed champion of the European folk scene. Attracting in excess of 700,000 visitors to the Breton sea port during a ten day feast of music, song and dance from the Celtic diaspora, the festival presents 200 events and invites 5,000 performers including many representatives from the Isle of Man. 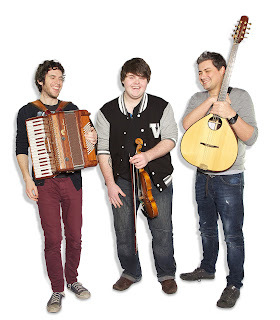 In recent years the Manx contingent has forged even greater links with the festival and shown that it can punch above its weight by winning the celebrated Tropheé Loic Raison (for the best performing folk group) twice in the last four years. And it’s the consistently high quality of our local musicians which has led to the festival committee embracing a variety of new ideas from the Manx delegate Aalish Maddrell. This is already bearing fruit with the Isle of Man co-hosting an evening concert in the historical Eglise St Louis which will include David Kilgallon playing his own Manx organ compositions and working as a duo with one of the Island’s most talented musicians, Russell Gilmour, on trumpet. Joining them will be Ruth Keggin and Dave Pearce from Nish As Rish; winners of last year’s Tropheé Loic Raison. Ruth has also been invited to open the nightly stadium concerts with a Manx Gaelic song in her distinctive style, which is acknowledged to be a great honour. Aalish Maddrell commented, “I feel exceptionally proud to be the Isle of Man’s delegate. Over the past few years the Island’s musicians have built up an outstanding reputation with both festival goers and organisers. In my opinion Manx performers stand out as being some of the most innovative at the festival. We may be the smallest of the Celtic nations but the Isle of Man more than holds its own on an international stage at a festival that hosts over 700,000 people”. But this year the Island is even more determined to make its voice heard. Local duo Turrys, seminal Manx band Mactullagh Vannin and the dynamic northern based dance group Ny Fennee will all make the journey to Brittany to express the unique culture of the Isle of Man. However, all eyes will be on new trio Barrule who will be striving to win the coveted Tropheé Loic Raison during the 2012 festival, where they will also release their debut eponymous album. It’s also a good opportunity to attract visitors to the Isle of Man with representatives from the Island also manning a pavilion, selling Manx seafood and beer and promoting the Island as a destination for cultural tourism.